Too many clothes and not enough storage? 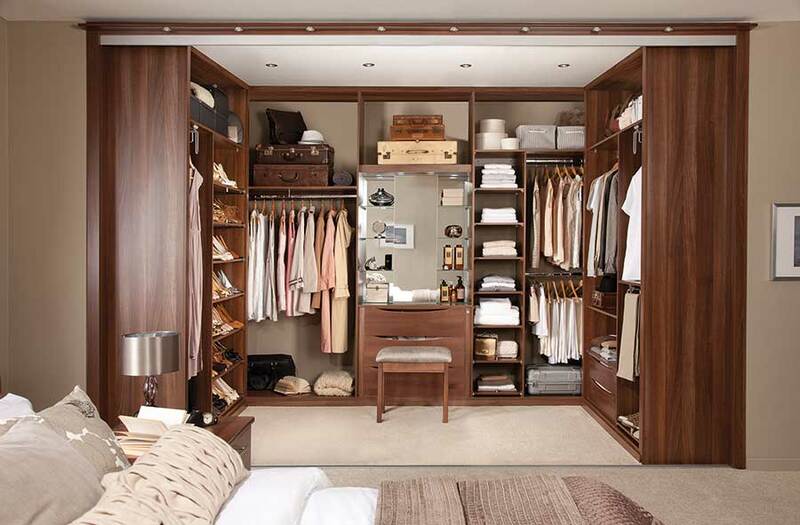 A walk-in wardrobe could solve your problem. It’s likely to be more affordable than you think, and practical too, as you’ll find it easier to find a killer outfit when you can see all of your clothes at a glance. Your garments will benefit too: they’ll stay in better condition as they’ll have more room. Walk-in wardrobes aren’t difficult to create and design, and you could find that they help you make better use of your space. Use our tips to create a walk-in wardrobe, whatever your budget. Add an extra touch of elegance to your bedroom with sleek sliding doors from the Spaceslide range, seen here in Grey Mirror with a titanium frame (from £810). You don’t need a huge budget to create a walk-in wardrobe – you just need a space for it. That can range from an under-used corner fitted out with affordable shelves and hanger rails to a whole room boasting bespoke storage – it simply depends on the space you have available and how much money you want to spend. Create an affordable solution using off-the-shelf storage systems, such as those by Ikea. These ranges may seem basic, but they can be adapted to any sized room, and they’re priced by piece so you can keep track of what you’re spending. If DIY isn’t your area of expertise, plenty of companies offer a full consultation and installation service. Prices vary, so shop around to find one that suits your budget. Money no object? Consider approaching an interior designer to tailor a walk-in solution to your exact specifications. Get stylish storage with this stone-grey walk-in wardrobe with full-height shoe cascade, handy pigeon hole shelving and handbag display shelving. Prices for a fully fitted Sharps bedroom start from £2,000. There’s a common misconception that you need acres of space for a walk-in wardrobes but in fact, but as long as you can step in and stand in the space comfortably, you’ve got everything you need. “A minimum depth of just 1.5m is all that’s required, making this storage option available to almost any bedroom size without drastically reducing the overall feel of the space,” says Andy Briggs, head creative at Spaceslide. Stick to sliding doors if your bedroom is particularly small. This means you don’t need to allow any leeway for a door to swing open. A walk-in wardrobe is more affordable than you think. The CLOSE-IT storage system is available at Regalraum and costs from as little as £125. Got some spare space in a spare room? A corner that’s not being used efficiently? 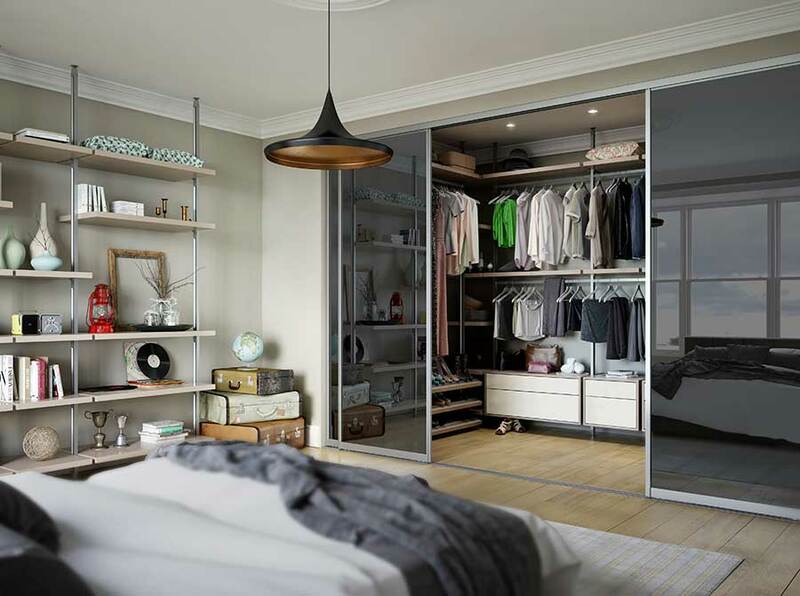 Some creative thinking could help you turn it into a walk-in wardrobe. This Sharps walnut walk-in wardrobe is a lesson in how to maximise an awkward bedroom alcove without sacrificing style. Prices for a fully fitted Sharps bedroom start from £2,000. Start by thinking about the amount and types of clothes, shoes and accessories that you have. Then focus on the space you’ll need to store them. For instance, if you own lots of dresses, ensure you have enough long hanging space. Hundreds of handbags? Hooks or partitioned shelving might be the answer. An abundance of belts, ties and socks? Shallow drawers with built-in dividers will put them in good order. Don’t forget to plan some space to store seasonal clothes when they’re not in use. Signature room dividers in soothing grey translucent glass are perfect for carving up a large room to create space for a walk-in wardrobe. Those shown as priced from £1,140 at Spaceslide. 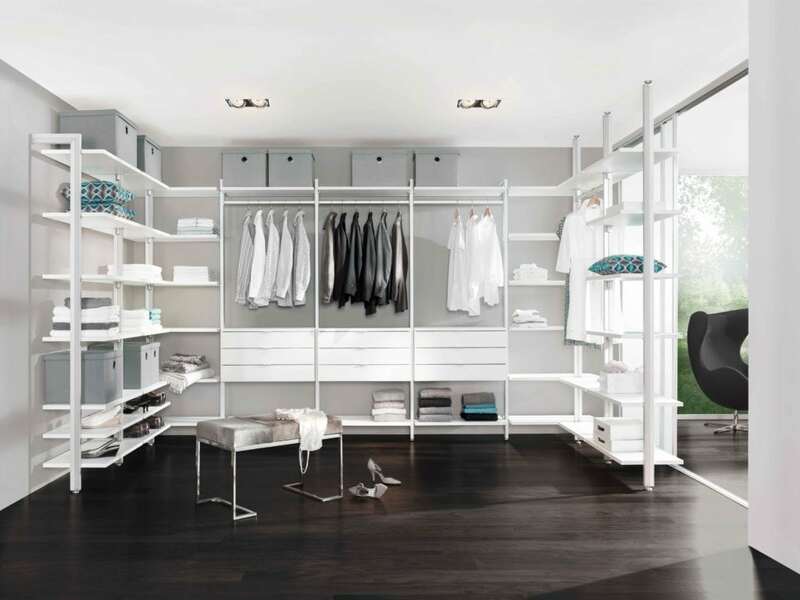 You’ll have space from floor to ceiling to play with in your wardrobe, so check you can reach everything. If you incorporate high shelving, think about including a slide-along ladder or set of portable steps. “Our top tip for laying out a walk-in wardrobe would be to ensure that all of the storage is easily accessible,” explains Rachal. “If you’re sharing the wardrobe with someone else, separating the areas out for each person is a great idea,” she adds. Some companies let you create a virtual wardrobe online. They’re a great way to play around with the space and the look to get a good idea of what you need. The beauty of a walk-in wardrobe is that everything is hidden behind closed doors, creating a clutter-free sleeping space. 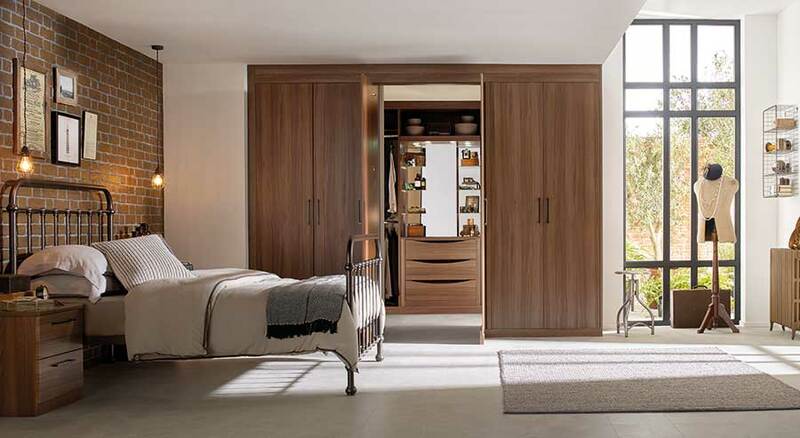 Prices for a fully fitted Sharps bedroom, including these walnut doors, start from £2,000. Sliding doors will save you space as the wardrobe doors sit flush and don’t need room to open. “Panelled sliding wardrobe doors are ideal for adding a splash of colour to the bedroom. Not only will you create an individual style by using varying textures in the door panels, but this technique injects colour and depth to a plain bedroom,” says Andy. Alternatively, silver mirrored sliding doors are a luxurious option that will stand the test of time. “Mirrored sliding doors not only help to make a room appear bigger as they bounce natural light around the space, they can future-proof your bedroom styling as they can be worked into most interior trends,” Andy adds. Not all walk-in wardrobes need to have doors: if you have an unusual shaped or small room, they can limit the space you have. “Opt for open shelving and hanging to perfectly display all of your possessions,” advises Rachal. Desperately seeking more storage space in your bedroom? Fitted wardrobes will instantly create more space and can be tailored to your room and lifestyle.